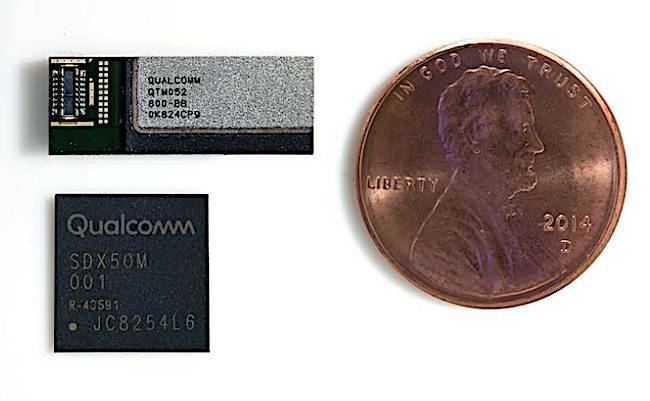 Pic Qualcomm is getting ready to ship one of the relatively boring bits of the 5G puzzle – well, perhaps boring for you, but fascinating for electronics geeks: a compact transceiver/antenna combo that fits inside phones to provide 5G millimetre-wave communications. Mm-wave transmissions are a crucial part of ultrafast next-generation mobile broadband, aka 5G: carriers with multi-gigahertz millimetre-wave bands can transfer more data per second over the air to and from handhelds and cellular towers, and handle more devices at once, than today's 4G/LTE technology. The trouble is that mm-wave communications don't have much range, are quite narrow and focused, and can't penetrate walls and get into buildings. A suitable transceiver and antenna array on a phone needs to do a lot of work – such as finding and steering signal beams no matter which way up you're holding the thing, and deal with weak signals bouncing off people, cars, trees, and so on – all to maintain a decent connection to the nearest phone mast. And it has to be small and low power enough to fit inside a smartphone. In fact, more than one needs to be in there so the signals still get through regardless of how you're holding the phone: your hand will block the transmissions of one module, leaving the others to do the job. It's that fiddly and weak. On Monday, Qualcomm revealed its mm-wave 5G antenna technology and transceiver, both designed to work with the company's Snapdragon X50 modem, and fit inside handsets. Qualcomm techies have also been closely working with phone mast makers, carriers, communications watchdogs at national regulators, and software developers, to optimize their 5G gear and apps for its 5G stack. In other words, if you're competing against Qualcomm in the radio modem world – cough, cough, Intel, MediaTek – be aware it is working closely with cell tower equipment makers and mobile networks to tune the positioning and output of their mast antennas so that mm-wave 5G works well with Qualcomm's particular miniaturized smartphone antenna arrays. Qualcomm really wants to be first out of the gate with 5G so that public infrastructure is optimized for its hardware, and not its competitors. Beam steering and beam tracking – adapting the shape of the signal to maintain a connection when someone's moving. These, Qualcomm explained, improve both the range and reliability of the signals. The QTM052 modules include a 5G NR transceiver, power management circuitry, RF front-end components, and a phased antenna array. The modules support up to 800MHz channel bandwidth in 26.5GHz to 29.5GHz spectrum, and also cover the 27.5 to 28.35GHz and 37 to 40GHz bands. Qualcomm reckons four of the QTM052 units can be packed into a smartphone. Samples of the radio modules are in the hands of phone designers right now, we're told, and Qualcomm said it expects device makers to launch QTM052-equipped devices in the first half of 2019. The QPM5650 and QPM5651 include a 5G NR PA/LNA (power amplifier, low-noise amplifier), switch and filtering subsystem. The QDM5650 and QDM5652 omit the power amplifier, but add multi-input, multi-output (MIMO) support. The modules include switching designed to optimize massive MIMO applications, and cover the 3.3 to 4.2GHz, 3.3 to 3.8GHz, and 4.4 to 5.0GHz bands. Qualcomm doesn't name the brand of the non-Android smartphones – cough, it's Apple's iPhones – it merely said smartphones using its Snapdragon radio electronics outpace handsets that use Intel's XMM 7480 and XMM 7360 cellular modems (really, they mean iPhones: Apple uses a mix of Intel and Qualcomm parts, and Qualcomm would rather Apple uses just Qualcomm). Qualcomm got its figures from netizens performing about a million tests using the internet speed-testing tool Ookla, which gathered up the numbers, anonymized and grouped them, and gave them to Qualy. The results were taken from Snapdragon 845-powered 'droids and unnamed Intel-powered mobes on the AT&T and T-Mobile US networks in America. The numbers are said to have been signed off by Ookla rather than have been cherrypicked by Qualcomm. Ookla can, we're told, detect what device model and chipset you're using.